Originating from West Africa, this black and white speckled bird was first imported to Europe by the Portuguese in the sixteenth century. As well as being a popular meat in West Africa, French and Italians chefs can’t get enough of it, and are some of the biggest guinea fowl producers in Europe. The birds are generally a little smaller than a chicken and their flavour is somewhere between chicken and pheasant, with a mild gamey flavour. It’s the perfect bird for you if you find cooking game tricky, but would like to give something new a try. Roast or braise in a stew or curry as you would a chicken, but make sure to adjust your timings accordingly as guinea fowls are a little smaller and generally contain half the amount of fat as a chicken, meaning they can have a tendency to dry out if not cooked with care. Guinea fowl season in the UK runs from September through to February. They are readily available in larger supermarkets these days, and as with all meat, organic and free-range birds are not only more ethical, but provide tastier meat. You want a bird no older than fourteen weeks – the younger the bird, the more tender it will be. Older birds should be reserved for braising to ensure the meat doesn’t dry out. One bird should feed 2–3 people, so make sure you buy enough if cooking for a crowd. Although they’re pretty uncommon, guinea fowl eggs are a wonderfully rich treat! 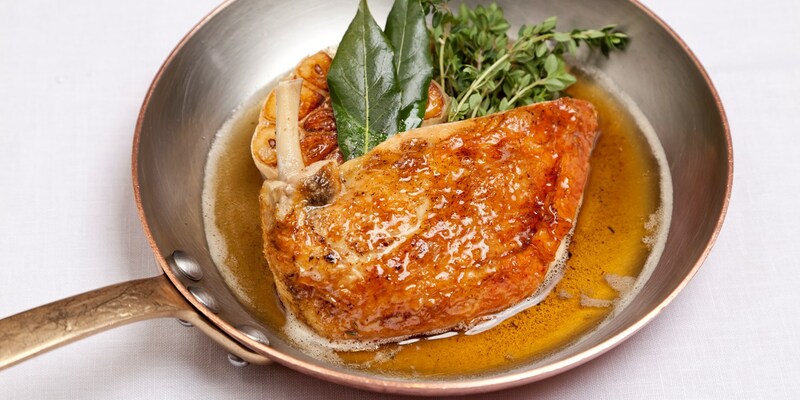 See below for a classic, simple method for cooking guinea fowl. Guinea fowl comes into season in time for autumn and runs through until the end of winter, so naturally it pairs nicely with earthy, autumnal flavours like mushrooms and beetroot, and robust winter root vegetables such as celeriac or parsnip. Like other game, it is also delicious with winter fruits such as quince, plums or prunes. The legs benefit most from braising, and make a lovely, lightly gamy guinea fowl terrine. Theo Randall uses Italian inspiration with robust autumnal flavours of cavolo nero, gorgonzola and chestnuts for his stuffed guinea fowl recipe.